In the last few years, Virtual Reality has taken the world by storm with its seemingly endless applications across a range of industries from gaming to medicine. Many technology companies such as Antycip Simulation have worked on the VR CAVE – Cave Automatic Virtual Environment system, which overcomes some of the biggest flaws and limitations users find with HMDs, especially in engineering and scientific applications. Whilst HMDs have been used in virtual reality gaming and a few engineering applications, the CAVE was developed for use within scientific and engineering industries. The CAVE uses large screens, at a distance from the viewer, allowing more people to experience the VR and removing the discomfort and disorientation of wearing a headset. The benefits of the CAVE aren’t simply limited to its multi person usage but how incredibly immersive it is without isolating individuals from their real-world surroundings. One of the biggest issues with HMDs is how the user is completely isolated from the real world which users can find disconcerting, disorienting and even frightening. There is also a risk of users walking into walls, furniture, or other people. Tracking errors can also be prevalent in budget HMD’s, which can be distracting to the user, completely, taking them out of the immersive reality. CAVE tracked latency errors are much less noticeable as the user’s position and line of sight is not locked to the projection. 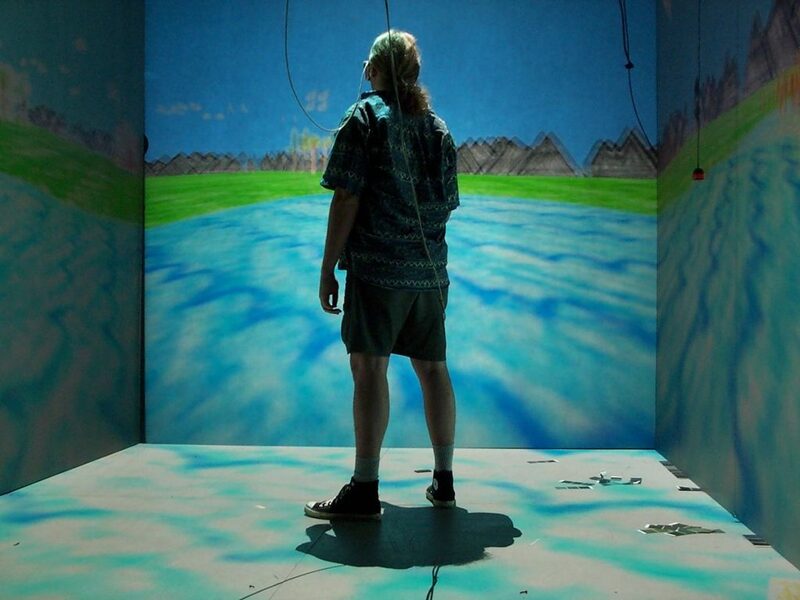 A standard VR CAVE configuration works by projecting images onto three sides with a fourth projector displaying a related image on the floor. The display will be a 3D stereoscopic image, projected at 120 Hz and controlled by a computer that uses a high-end graphics card. This combination allows for a full room of immersive three-Dimensional visuals that can be viewed by groups of people. The CAVE can allow viewers to easily manipulate intricate 3D models with natural human based interactions. A VR CAVE is the perfect system to thoroughly explore design, data and more.The applications of the CAVE stretch far, with engineers, scientists, those in the medical field, designers and more all being able to work in a comfortable and immersive room for long periods of time. The CAVE is arguably a more productive use of VR allowing for face to face discussion and for visuals to be better discussed and understood. It is easier to step out and take a break knowing that everyone is at the same stage in their VR learning. The professional uses of the VR CAVE outweigh that of HMDs, creating an immersive, and more comfortable environment for multiple people to use at the same time.